"What are like fractions and unlike fractions?" , this question is having had by almost all the students who study 5th grade or below 5th grade in school. The answer for the above question is illustrated clearly in the picture given below. In two or more fractions, the denominators (bottom numbers) are same, they are called as like fractions. In the above fractions, all the denominators are same. That is "5". In two or more fractions, the denominators (bottom numbers) are different, they are called as unlike fractions. In the above fractions, all the denominators are different. They are 5, 7, 9 and 2. 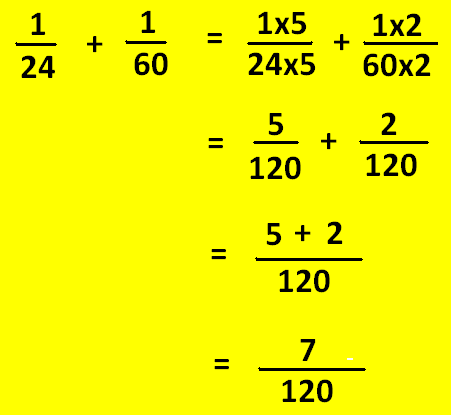 When students want to identify the like fractions and unlike fractions, they have to do a simple work which is mentioned below.That is, they just have to look at the denominators (bottom numbers) of the fractions. If they are same, they can say that they are like fractions. In case the denominators are different, they can say that they are unlike fractions. When small kids have this kind of doubts in math, they will struggle a lot understand. When this kind of concepts are explained in picture as given above, they will be able to understand easily. Why should we know the difference between like fractions and unlike fractions? After having understood like fractions, unlike fractions and the difference between like fractions & unlike fractions, students have the question, "Why should we know the difference between like fractions & unlike fractions?" or "What is the use of knowing the difference between like fractions & unlike fractions?". To get answer for this question, let us read the statements given below. When students do problems on the topic "Addition and Subtraction of Fractions", always they have to know the difference between like fractions & unlike fractions. Because, adding or subtracting two or more like fractions is always easier. But when we want to add or subtract two or more unlike fractions, first we have to make them to be like fractions using least common multiple of the given denominators. Then only, we will be able to add or subtract two or more unlike fractions easily. We hope, now the students would have understood the reason for why we should know the difference between the like fractions & unlike fractions. Whenever we want to add two more like fractions, we have to take only one denominator and add numerators. This process is clearly demonstrated in the picture given below. In the above two fractions, we have the same denominators. That is "24". We just take only one denominator and add the numerators 15 and 3. When we do so, we get 18/24. Further, it has been simplified to 3/4. Whenever we want to add two or more unlike fractions, we have to find the least common multiple (L.C.M) of the denominators given. Our next question is, how to find least common multiple of the two numbers/denominators. 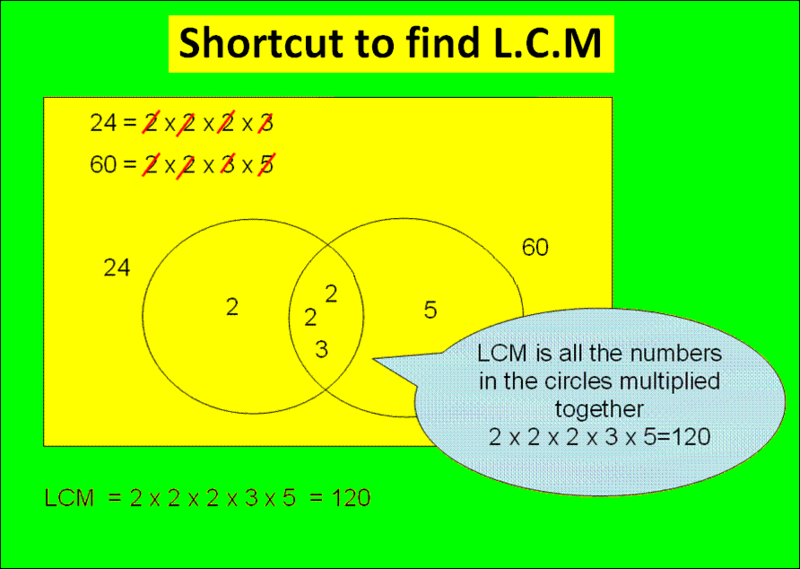 The way of finding L.C.M of two numbers is clearly illustrated in the picture given below. In the above picture, a shortcut is given to find L.C.M of two numbers "24" and "60". L.C.M of "24" and 50" is "120". For example, if we want to add the two fractions 1/24 and 1/60. First we have to get L.C.M of the denominators 24 and 60. That is 120. Now we have to make each denominator as the value which is L.C.M 120 by multiplying some constant. This process is clearly illustrated in the picture given below. In the first fraction, we have the denominator 24. To make this 24 as 120, we multiply the denominator 24 by 5. When we do so, we have to multiply the numerator also by 5. After having multiplied the denominator 24 by 5, it becomes 120. In the second fraction, we have the denominator 60. To make this 60 as 120, we multiply both denominator and numerator by 2. After having multiplied the denominator by 2, the denominator becomes 120. Important : Whenever we want to change the denominator of a fraction, we have to multiply both denominator and numerator by some constant. Not just the denominator. Since we want to change only the denominator, some students will multiply only the denominator by some constant. Even though we want to change only the denominator, we have to multiply both numerator and denominator by some constant as given in the above picture. After making the denominators equal, the process of adding two fractions is easier. That is, we have to take only denominator and add the numerators as explained in the above picture. In this webpage "Like fractions and unlike fractions", we have not explained only about like fractions and unlike fractions. We have also explained how to add like fractions and unlike fractions. 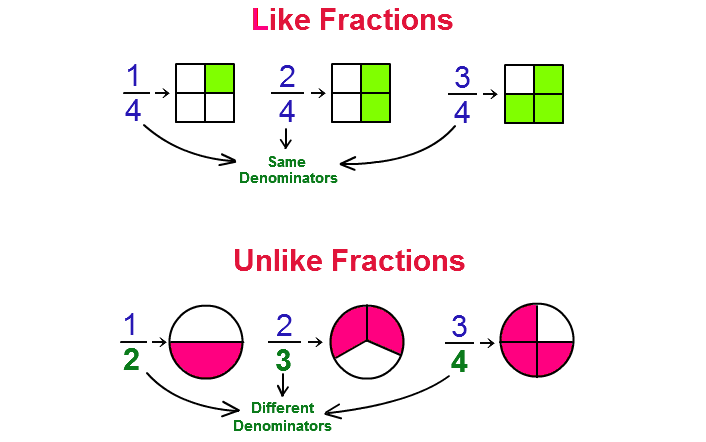 You can also visit the following pages to know more about like fractions and unlike fractions.